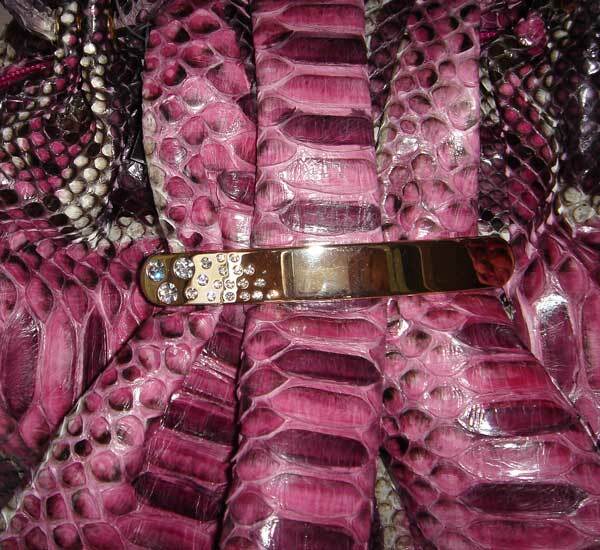 One of the questions we are most frequently asked has to do with our python skin handbags. Many people still ask us what the difference is between the various types of python skin that we use and why a handbag made with one type of python costs more than another made with a python skin that is maybe more restrained in colour but nonetheless elegant and refined. Here we have tried to respond to all the queries we get about our python products, to help our customers understand the differences and make the right choice when ordering their python handbags. What varieties of python skin does Gleni use and what are the differences between them? As you probably already know, at Gleni we offer our customers several varieties of python skin to choose from when ordering their custom-made handbag: trapper python, cosmo python, indio python, millennium python, decolored python. The differences between the several varieties of python skin. 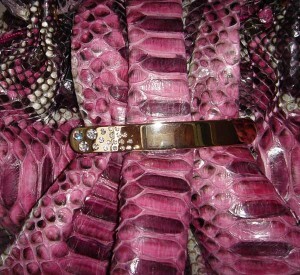 Where can I find general information on Gleni’s python handbags and see all the available colors? Here however we’d like to go in depth into some of the other questions regarding our python handbags. Why does the same handbag model cost more in certain types of python skin? It often happens that a customer e-mails us to find out the availability of a python handbag they have chosen in trapper python; and as sometimes happens that model in trapper python might be temporarily out of stock in our showroom for immediate delivery, but the same model may be available there in one of the more expensive python varieties. We will always offer our customers this option as an alternative, if they are looking for a handbag to be delivered as soon as possible, but if they prefer not to buy this more expensive handbag they can still order the handbag to be made in trapper python from our Craftsman Laboratory at the same price advertised for that type of leather in the Gleni Boutique. The higher price of a handbag made from our indio, cosmo and millennium python skins, is a genuine reflection of the higher cost of producing these leathers, which, as many of you already know, have a longer and more delicate and complex coloring process than the Trapper and decolored python skins. If you would like to read more on the hand painting process please read our page on python colors and varieties. We would like to reassure all our customers that, by offering you the handbag in a more expensive variety of leather, we are in no way trying to take advantage of your good faith by selling you a more expensive handbag, but are trying to find the right solution for you in this particular case of the handbag you chose being out of stock. We would be equally happy to help you order your bag to be made especially for you in the trapper python from our Craftsman Laboratory if that is the solution you prefer! Are python handbags better in patent or matte finishes? Our python handbags can be made in many different colors and shades and are available both in shiny patent (lucida) or matte (opaca) finishes. YOUR PERSONAL TASTE: some customers prefer the shine that the patent finish gives to their python handbag (which effectively has a glossy film covering the leather that adds brilliance to the handbag itself), while others prefer the matte version as they like the more natural look. It is up to you to decide which finish you like best. Please remember that once the bag has been made in matte leather it cannot then be given a patent finish. It would be too risky a procedure for the leather and is almost impossible. Some people order a handbag in a matte finish and then ask us how they can make it shine more and we have to regretfully reply that they can’t, it is meant to have that natural matte feel. We advise you to think carefully about the finish you prefer before ordering your handbag online. THE LATEST FASHION TRENDS: every year there are new fashion trends and this year patent is in! For this reason the tannery that we have been using for many years, has decided to create new colors in a patent finish, and we noticed immediately that for some colors patent is far more effective than matte, giving the handbag a different look that is more energetic and very elegant. THE AVAILABILITY OF THE COLORS: Not all the colors in our python ranges are available in both patent and matte finishes. Some colors that are much more effective in the patent finish are only produced in this version, while other colors have been created especially for the matte effect and so are still produced that way. For example red and black are produced in both finishes, matte and patent,, while walnut (noce) is only available in a patent finish. HOW YOU INTEND TO USE YOUR HANDBAG: python skin, as a natural leather requires a lot of care to keep it in good condition. It should be protected from rain and any liquid spills, as it tends to absorb liquids and can be seriously damaged by them. Patent python leather however, having the thin film of patent finish, is slightly more water resistant than matte python leather and just a bit easier to clean. So if your handbag is likely to be exposed to the elements in a damp and rainy climate, we advise you to choose a python color with a patent finish, so that your handbag will not only be shinier but also more protected. However both versions of python skin, patent and matte are very soft to the touch and gorgeous to look at. The patent leather does give a fascinating and glamorous air and makes the color more striking, but the matte python skin has the advantage of keeping the characteristic scales softer, giving the whole handbag a lovely soft natural feel. Both versions are equally high in quality and prestige. A piece of advice from our personal point of view: in our opinion black is far more effective in the patent version than in matte, as the gloss highlights the characteristic scales and texture of the python skin, making the patent black handbag incredibly chic and elegant. Below we have collected links to pages on our website where other frequently asked questions about our python handbags have been discussed in detail already, so that all the important information is easily found from this one page. Does python need a Cites certificate to be exported? What is involved in this procedure? What are the most fashionable colors in python skin this year? What are patchwork python handbags? Where can I find general information about python leather handbags and the colors that they are available in? How should I care for my python leather handbag and what should I do (or NOT do) to keep it in good condition over the years? Хорошая заметка. Добавил Ваш блог в закладки. Не в каждом блоге сейчас встретишь столько интересных и полезных мыслей, которые можно применить на деле. Но понадобится еще время, чтобы осмыслить инфу. Даже сейчас, когда после прочтения текста Вашего поста, в тот момент, когда пишу комментарий, я думаю, о тех вещах, смысл которых мне теперь совсем по другому видится. Эх, что за день сегодня – полезный день. We update our blog every Monday morning! Stay tuned for new content every week!